Jason is a leader I want you to get to know. He’s been on our team here at Liquid Church for less than a year but has done so much to help us “reboot” our worship culture. We charged him with the task of rebuilding what we do … and more importantly who we are on this front and I am so happy with everything he’s been up to. He’s been making steady progress and taking us to a whole new level. Today I’m honored to have Jason give you a bit of an insight into his thinking and practice that is helping us revitalize our worship ministry! As a leader I am always fighting against the deadly poison of monotony and complacency within myself and within the people whom I serve. Solomon wasn’t kidding when he wrote “without vision, the people perish: but he that keeps the law, happy is he.” (Proverbs 29:18) Vision is crucial not only for the organization as a whole, but also for its subcultures within. Its how you move from surviving to thriving. My subculture is in the area of worship music. We get to (notice I didn’t use the words “have to”) provide an environment each and every week that enables people to experience God through music and song. That sounds pretty cool and engaging but the reality of the week-to-week can get quite dull and colorless if you are not intentional to fight against it. So how do you fight against it? Pay attention to the latter half of the proverb, “but he that keeps the law, happy is he.” You have to create a ‘law’ that constantly challenges your people and defines a directional purpose of engagement for them. In layman’s terms – you have to be very intentional to be a great steward of your people and their time so that they will want to continue to invest their lives in the subculture that you are creating. 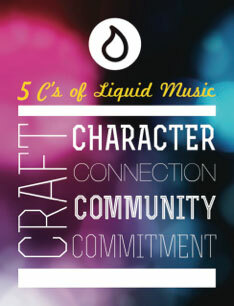 We currently have around one hundred musicians on our Liquid Music Team and we go by the “law” of the 5 Cs. Everything we do and every decision we make as a department is centered on these 5Cs. *Disclaimer – if you are creating a vision you must make sure that the vision of the subculture coincides with the vision of the entire organization. Anything less is uncivilized. This ‘law’ has been very helpful for us as a team to stay in thriving mode. I hope it sparks something in you to revitalize your culture as well. If you have any questions in regards to the 5Cs or creating culture please feel free to comment below or send me an email at [email protected]. The information above is a part of my forthcoming book “Get Out of the Green Room”. You can join the exclusive list and receive behind the scenes information and materials by clicking here. I am honored to share on the unSeminary blog today. I would love to hear your thoughts about my post. Let’s start a conversation! Great idea, but I have a group of 8 musicians. All of them are VERY talented, but I have trouble getting them to even practice before rehearsal much less commit like above. I am new to Worship leadership. Any thoughts or ideas? People rehearse in different ways. I have found that beginners-intermediates need lots of practice, which bores experienced musicians to tears. I have had good results from having one group that works on about 5 written arrangements per rehearsal for about 5 weeks on each song, performing one song per week and adding one new song per week. The SECOND group is made of people that can get together an hour or two right before the service and run through a bunch of service music “pick-up style”.These are people who can either improvise, make up their own harmonies on the fly, or sight-read like a son-of-a-gun. They are great for leading hymns and otherservice music. Hope this helps! George Mekhail on launching multiple campuses after closing the first one.